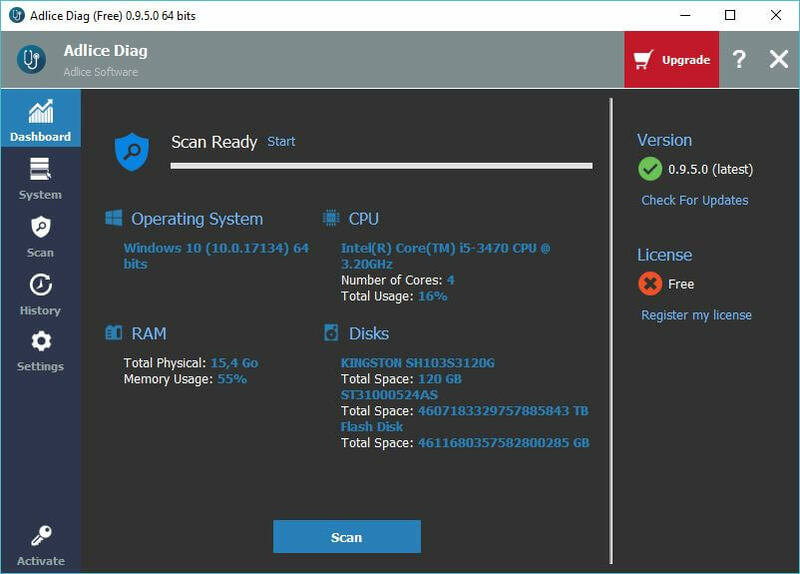 Adlice Diag is a hybrid diagnostic software, with builtin Anti-malware engine. Wow. 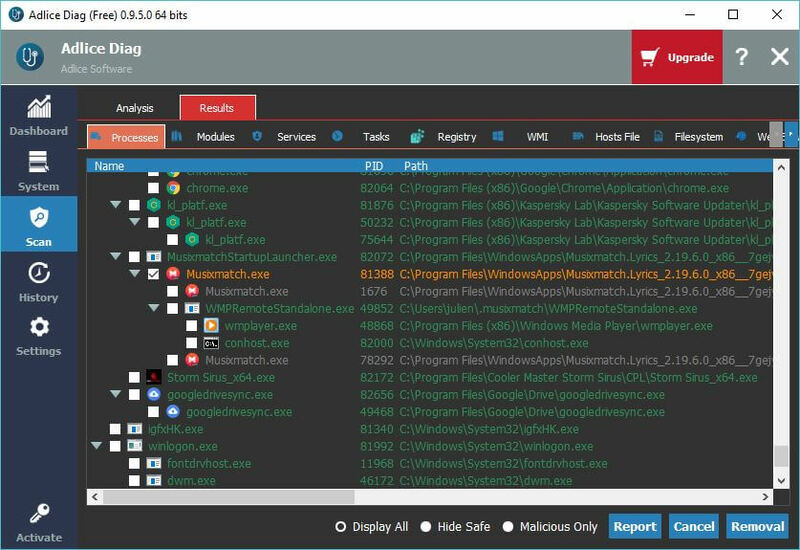 Imagine a software like FRST (or OTL, HijackThis, etc…) with a UI in the style of Autoruns (from Microsoft), and a Anti-malware classification layer coming from RogueKiller engine. Add some real-time monitoring features (like Process Explorer), a Software Updates check (like UCheck), and the ability to share your analysis reports with anyone with permalinks. If you can imagine, this is Adlice Diag. What’s the purpose of it? Why is it so different? We built this software so that anyone can get easy help from whoever is willing to help (forum, tech support). We also thought about self-taught people who need a cool software to diagnose their own machines. Scans are running blazing fast, in less than 15 mns for all the machines. Average machine runs the scan in 5 mns. 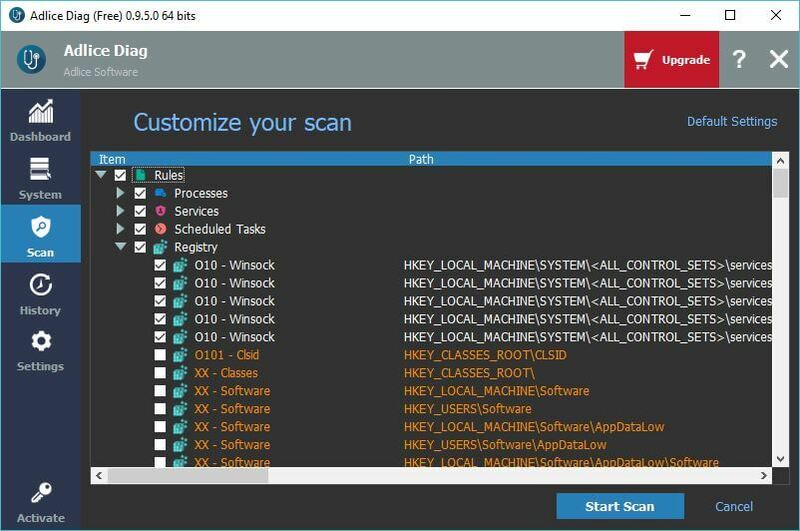 When running a scan, you can cherry-pick the scan rules from more than 50 rules available. This let’s you scan only what you need to scan. Scan results are displayed into categories (processes, services) and most of the time in a parent-child tree organization. Results are also classified according to their criticality (Anti-malware layer). Since it’s a diagnostic software, even safe and undetected items are shown, that’s the goal. That way, if our engine misses something, one will still be able to remove it. Yes. We have a BETA program going on, so please feel free to download the soft and try it. The software looks unfinished. What’s next ? Yes. We release the BETA version now because we are confident about the malware removal feature, and this is the first thing we want to stabilize. Now, we are working on the server-side version, to improve the report page and give you access to a full featured removal workflow exchange. In the future, when getting some help on the forums, the OP (requester) will be able to share his report with the helper in a secured way (permalink and unique access to a designated person). The helper will then create a removal script on the web ui (by only checking items), and once validated, the OP will get a notification of a removal script ready to be applied. After application, the machine is cleaned. No longer copy/pasting long reports on the forums. No longer exploding helpers’ eyes on reading those reports in a badly formatted way. No longer waiting for notifications from various forums, everything is in 1 place with email alerts and notifications, and ordered by date and status. Real-time (or System) tab will come very soon. You will be able to explore running processes (and kill them), running services, network activity and such. When it comes to security, Software updates are really primordial. We are in the process of migrating the UCheck code into the RogueKiller engine (SDK). This means its features will be accessible from any other software of our galaxy, and especially Diag. We will add a basic version of UCheck engine into Diag, which will let you know if some updates are needed. Is it FREE ? Where can I buy ? Adlice Diag is FREE to use for anyone as long as we are in the beta program (0.X.X version). The cart button is going to a missing page for now, because later the Premium licenses will be available on that page. In the future, the software will be FREE for personal use, including malware removal on the forums. Everything business related will need to purchase a license. The price is unknown yet, but it should be around the same price as for RogueKiller (20$/year). During the BETA program, all features are unblocked, and there’s no nag screen. If you missed the download link for Adlice Diag, it’s here. PreviousPrevious post:Introducing RogueKiller V13NextNext post:KMS Activators, are they Malware?